A man has been jailed for eight years for robbery after he was tracked down using CCTV from surrounding homes and businesses. Adrian Kosmider, 25 of Dartmouth Avenue, Woking, broke into a property on Fordbridge Road, Sunbury-on-Thames in the early hours of 16 December 2018 while the victim, aged 82 was sleeping. He pleaded guilty to the offence at Guildford Crown Court on 7 February and was sentenced on 28 February. He bound and gagged his victim using her own clothes before warning her not to move or make a sound otherwise she would be killed. He then ransacked her house, stealing all her jewellery worth approximately £50,000 before leaving. The woman was able to free her restraints and discovered they smashed all her home phones and took her mobile to prevent her from calling police. She crept out of her property and alerted neighbours who rang police around 3.45am. CCTV footage from houses and businesses in the nearby area pointed officers towards an individual and a vehicle. 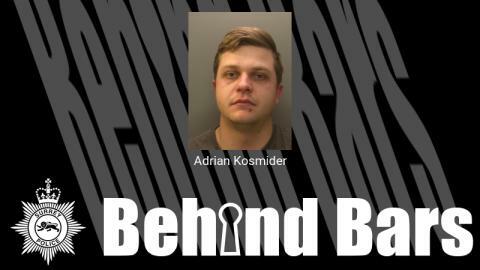 Using the CCTV footage, we tracked the car to a petrol station and located its number plate and our colleagues at Thames Valley Police stopped the car in Slough and gave us due evidence to issue a warrant for Kosmider’s home address. The defendant was not present at the warrant but, during a search of the property, we located some of the jewellery. The offence had a profound effect on the victim, who feels she has lost her independence. The victim said in a statement in January: “Physically during the incident I sustained blisters to the inside of my mouth and lips from the gag due to trying to bite down on it, to prevent it going further into my mouth and causing me to stop breathing. “I also sustained heavy bruising up both of my arms and the skin was broken on the top of my right hand causing considerable pain. “I feel that since the incident I have physically slowed down significantly. I feel cold at different times and don’t have the confidence I used to have. “Day to day I have been staying with my daughters and family who have been amazing and I feel humbled by their ongoing support, however I feel I have lost some of my independence and that my life as I knew it has been taken away from me, particularly during the evenings and I am now on sleeping tablets which have helped me sleep. Investigating officer PC Charlotte Irwin said: “This was a truly harrowing experience for the victim and she is still suffering in the aftermath of the attack. “People have been in her home and her bedroom at night and those places are sacred for anyone. “I am delighted that he has pleaded guilty to this offence and spared her the anxiety of a full trial. “I hope the fact that Kosmider has been jailed for a long time will help her in her recovery from the attack. “I would also like to thank the neighbours who helped our case by providing CCTV footage and allowing us to build a bigger picture about what happened. It played a key role in convicting this robber. “I hope the speedy resolution of this case helps showcase the fact that we take crimes like this seriously. “Surrey Police will always seek to hunt down people like him, arrest them and put them before the courts. Anyone with any information is asked to contact us on 101 (999 in an emergency) or report it online via http://surrey.police.uk/TellUsMore quoting reference PR/45180133422.